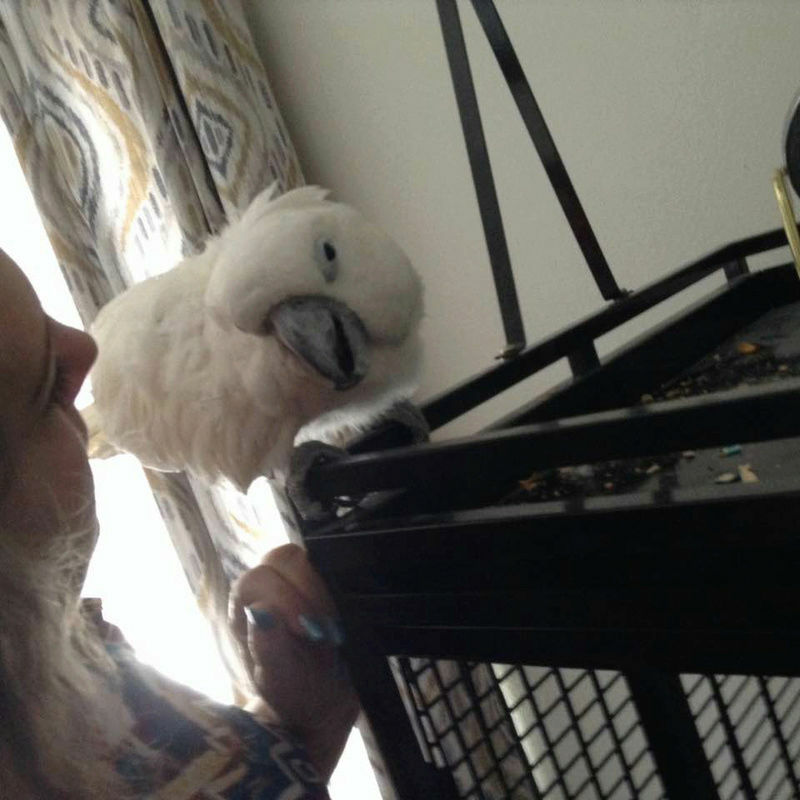 I met my grandmothers cockatoo yesterday! His first owners severely neglected him, so he didn't have a name for most of his life, and is still getting used to having one now. He's improved a lot in the rescue but will continue to improve in his new home, without a doubt. Casper was rescued from a family that kept him locked in a dark room. He only had one perch, no toys in sight, and they only interacted with him to feed him sometimes. He's an extremely affectionate little guy and as a result of this neglect, started plucking. 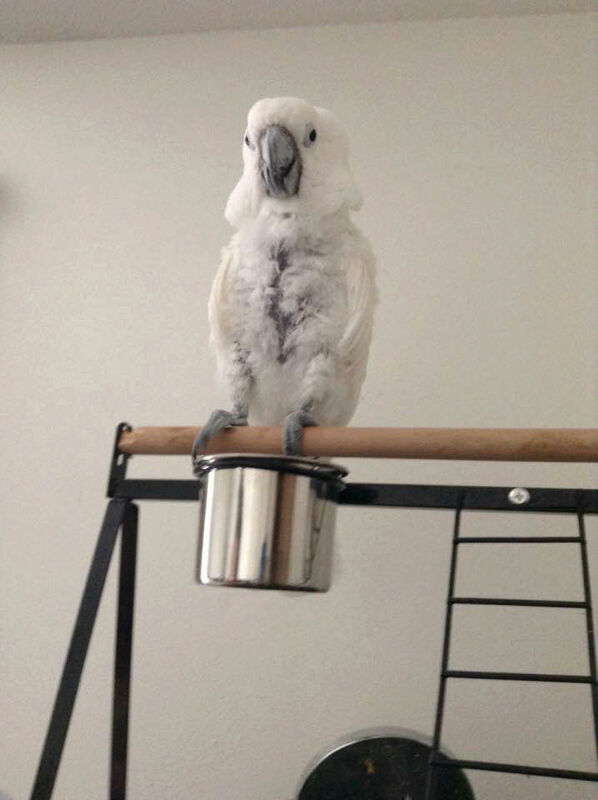 When he came to the rescue his entire chest was bald, but as you can see, he's improved immensely and is expected to get all his feathers back! In the picture you can also see he has a rounded band. He's too young to be a wild caught imported bird -- and he has the attitude of a handfed one -- so does this mean he was transported as a pet from out of country at some point in time? He still isn't eating pellets, but he likes vegetables and playing with his new toys. He settled in very quickly and wanted to cuddle right from the start. He seems to love everyone, coming up to greet them and throwing things for them to fetch. He is so, so cuddly and sweet, despite everything he's been through. There is something I've noticed about him that I forgot to ask about yesterday! He opens and closes his beak when you pet him, especially when you give him kisses or make kissy noises at him. What's this mean? Is he trying to mimic the sound, or is it a cockatoo language thing? He doesn't do it otherwise so I'm very curious as to what he's communicating. Last edited by rivx; 03-12-2018 at 07:59 PM. He sure is a handsome guy! 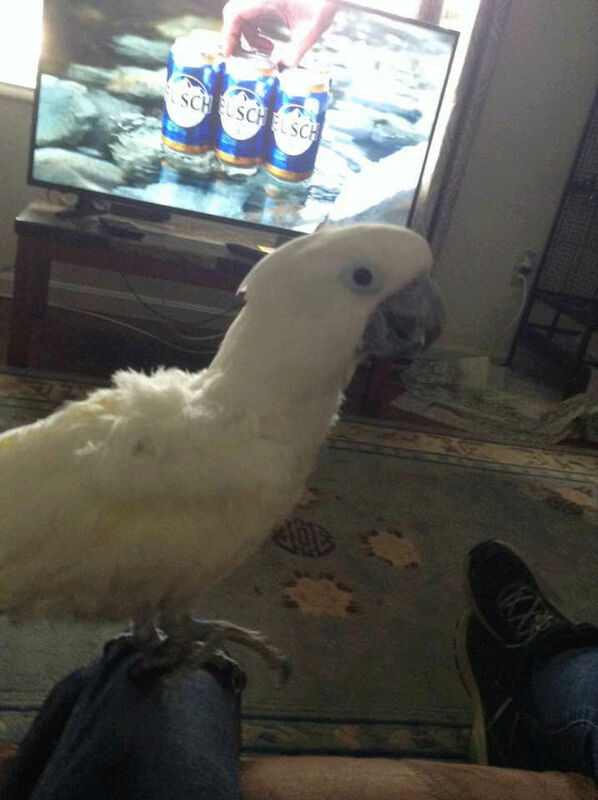 I don't know much about cockatoos. The only thing I do know is that they can become overbonded. Be careful of the petting as this may seem like a mating behaviour to him. Stick to the head. Hopefully others will be along that can give you more information. Kudos to your grandmother for bringing him into her home. What a sweetie, I love the photos. I am so happy that after years of lack of stimulation your Casper is making up for lost time by being nice to people rather than hating everyone which he has every right to do. He obviously has a warm heart and a lot of common sense. If he starts thinking about plucking those nice new feathers distract him with fun things. Our Casper's favourite toys at the moment are an empty plastic water bottle that he bashes around the room and an upturned cardboard box with a 'door' cut in the front face. There are pine cones and other odds and ends for him in there. I don't know what he does when he goes in but we hear a lot of giggling and muttering. He is currently demolishing the back wall so he can rush out and attack our feet. He does have a cupboard full of proper toys that he just ignores. I understand that cockatoos can be quite destructive, we get coloured wood pieces for making parrot toys and string them together on leather ties. Much cheaper than the purpose made toys which is good because our Casper gets through them quite quickly, whittling we call it. Last edited by Casper's 2nd best friend; 03-12-2018 at 10:27 PM. Oh what a sweetie he is! How lovely that your Gram-mom rescued him. It is truly amazing that he is so sweet. I can only imagine what a wonderful loving life he is going to enjoy. Looking forward to hearing more about him and the adventures you all have together. 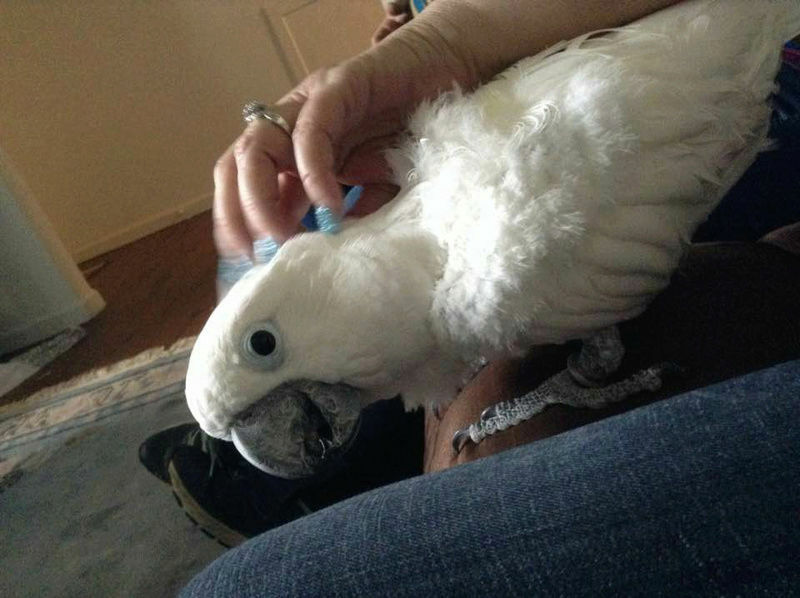 Sassy Goffin's girl, she IS Sassy Amigo, male umbrella cockatoo Chip! The cockatiel! The sweet, sweet Jellybean! Casper? Oh you mean that ball of green feathers fast asleep on my shoulder He's fine! Margaret said he had a bit of a crash landing when they were doing 'finger flying' earlier, he let go and ended up under his cage but strolled out pretending he meant to do it. Just one feather lost. Last edited by Casper's 2nd best friend; 03-20-2019 at 07:37 PM. Jean-Pierre, I’m happy to know that “your” Casper is doing well I’m not so bold to ask what was wrong with you but I hope your recovery goes well! I hope you recover as well, Jean!! Casper is a total angel, dancing king! Mischievous as any cockatoo for sure. He's much loved. My grandmother recently had open heart surgery and has had a rough recovery so he's currently being cared for by another individual she had picked out, but he loves everybody and is doing great. I'd say he was upgraded to ex-plucker status. I just love his fluffs. Last edited by rivx; 03-22-2019 at 03:49 AM. Thanks for all your kind words, it was an impacted wisdom tooth removal under full anaesthetic. I am feeling a bit sore and sorry for myself now. I wish your grandmother a rapid recovery as well River.